"We are talking about a completely voluntary programme," chief financial officer Luka Mucic said. The number of job cuts would be "slightly higher" than during a previous overhaul in 2015, he added, when the group shifted focus to "cloud" computing from traditional software. "We are expecting 4,400 job cuts, more than the 3,000 in 2015 and we think that Germany and the US will be the most impacted," spokesman Benjamin Nickel told AFP. Under the new turnaround plan, executives plan to spend between 800 million and 950 million euros ($915-$1.1 billion) on restructuring in 2019 "to further simplify company structures and processes". They aim to realise "a minor cost benefit" this year, before slashing annual outgoings by up to 850 million euros from 2020. "We are going to move our people and our focus to the areas SAP needs the most, AI (artificial intelligence), blockchain, internet of things, quantum computing," he said. SAP's restructuring announcement came as it reported net profit added just one percent last year to reach 4.1 billion euros. The group preferred to play up operating, or underlying profit that surged 17 percent, to 5.7 billion euros, on revenues up 5.0 percent at 24.7 billion euros. The result "sets us up perfectly for continued strong profitable growth in 2019 and beyond," Mucic said. One area the group hopes will stoke the bottom line is so-called "experience management" after it recently snapped up Californian firm Qualtrics for $8 billion. In 2018, SAP continued its transformation away from traditional one-off sales of business software licenses to cloud computing, under which it charges customers a subscription fee to process data on the firm's computers. Revenue from cloud subscriptions and support grew 32 percent over the year, to almost 3.8 billion euros. Meanwhile software licenses and support revenue shrank one percent, although it remains a far bigger source of income for now at almost 15.8 billion euros. 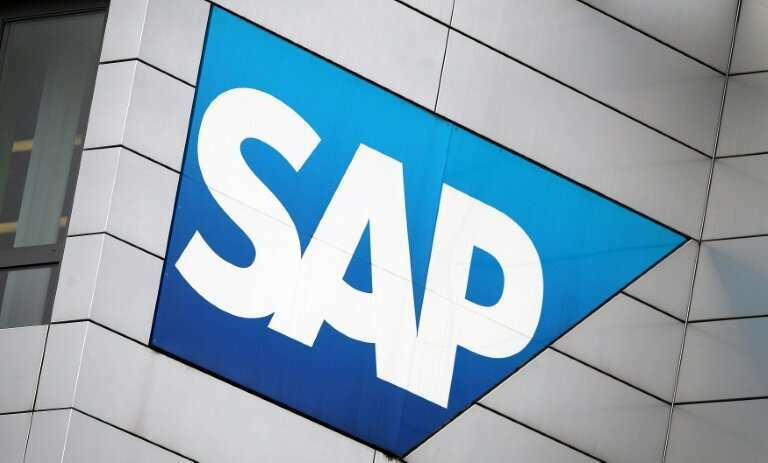 Across the whole group, SAP aims to increase revenue from its cloud and software activities to between 22.4 and 22.7 billion euros in 2019—up from 20.66 billion booked last year under non-IFRS accounting standards, which exclude some costs. Still in non-IFRS terms, the group aims for operating profit of 7.7 to 8.0 billion euros this year, up from 7.16 billion euros in 2018. SAP stock rebounded were trading down 2.4 percent at 90.15 euros around 12:40 pm in Frankfurt (1140 GMT)—while remaining the worst performer on the DAX index of blue-chip shares.